Sunday Stroll in Casa de Campo (Madrid). 17 3/4″x 22″, Rayon and cotton on cotton. ©2014 Joni Beach. The Story~As a piece in the “Visions of Spain” series, my memories of a relaxing sunny afternoon in a Madrid park is captured here…lunching beside the lake, enjoying the company of friends and family, strolling by the scenic red boats…or in Spain called el paseo. Artist’s Process~To create this design, first I pieced a background by layering fabrics. Then, using freehand cutting and raw-edge applique, trees, the fence, a stone wall, and other details were layered and stitched. The boats and the man were composed separately on a thin interfacing and I added details using threadpainting. Using free-motion quilting, these appliques were added and stitched onto the background . I added additional details with threadpainting and dense-stitch quilting. The cables and rings holding the boats together were made by stitching on cording and heavy threads. 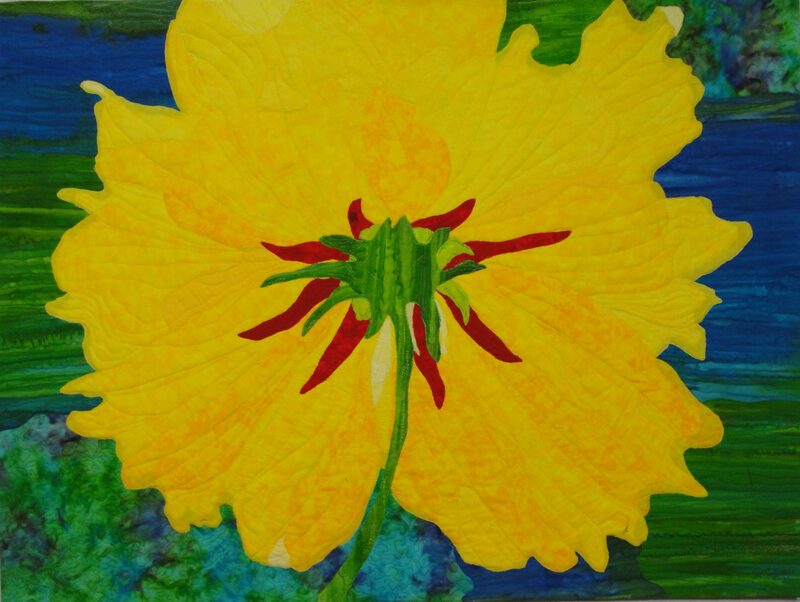 Original Art Quilt, Size 17 3/4″ x 22″. A hanging sleeve is added to the back for displaying. As a Free Bonus gift, a small slat with two holes is included (Can be hung with 2 pins or small nails~not included). Other options for displaying textile pieces included shadow box frames or mounting on canvas. Professional framers, experienced with preserving and displaying textiles, can be helpful with these and other ideas.